Children in traditional Hasidic Jewish attire run joyfully on the playground. Some of their playmates speak Spanish, others are Anglos with bobbing blond hair. Multiple languages float through the August air under the music. A Mexican band sings and strums its guitars as the sequins on the band members’ sombreros glitter in the sun. I sit with hundreds of people at picnic tables, munching food made by our neighbors: tacos, shish kabobs, falafel, pelmeni, borscht, pierogies, Maid-Rites, venison and pie. There is a sacredness to the event, a holiness to this community. This, I think, is what the reign of God might look like. Postville is not my hometown, but it was part of my parish cluster. I went to the rival high school about 10 miles away. I took pride in having friends from Postville who broadened my small teenaged world. Maria was a Russian immigrant who I giggled with about boys, and Susie, from Mexico, taught me how to pluck my eyebrows. Business was booming, houses being built and cultures were intermixing. Postville was a vibrant place. I took pride in having friends from Postville who broadened my small teenaged world. Peaceful unity among cultures was only part of the story in Postville. A group of citizens gained control of the local government and there were suspicions that they were also calling federal immigration officials to report the workers employed at Agriprocessors. It was well-known that many of the newcomers to town were undocumented. Eventually, tensions in Postville flared. On May 12, 2008, hundreds of outsiders came to town: ICE agents surrounded Agriprocessors, as Black Hawk helicopters chopped overhead. Murmurs of “illegal immigration” rippled through the town. Students wept at their desks in fear that they would never see their moms or dads again. Within hours, 389 workers were arrested, shackled and bused to the National Cattle Congress grounds in Waterloo, over 75 miles away. The assembly line court system that the immigrants would be channeled through had been designed for swift processing, not unlike the kill floor they had worked at the meatpacking plant. At the time, it was the largest immigration raid in U.S. history. ICE agents surrounded Agriprocessors, as Black Hawk helicopters chopped overhead. The immigration raid was a shock to me. I was unaware of how the Latin American workers were stirring divisions among longtime Postville residents until after the raid took place. I had assumed that every small town took pride in diversity; that the Christians in Postville—which was nearly everyone—understood that God’s reign is for all nations; that the meaning of Catholic was universal. Christ calls us all to promote and build up unity. But clearly not all the white citizens of Postville were on the side of the immigrants. The Catholic Church was clearly and visibly with the workers, though. St. Bridget’s Church became a place of refuge and aid for the families. Chaos had erupted all over town in the wake of the raid, as people suddenly disappeared, and it was unclear who had been captured. Mary McCauley, B.V.M., sent out the word: “Tell anyone who is afraid to come to St. Bridget’s.” By 7 p.m. there were more than 400 children and adults crowded into St. Bridget’s, stunned and crying, looking for their loved ones, too afraid to return to their apartments. The parish became a makeshift social services center—with church staff, lawyers and social workers attempting to tend to every need through the night and the weeks that followed. Church pews became beds, bread was broken and shared, toys distributed, prayers were made. The story of the church in Postville suggests that division is a cost of living the Gospel. In Postville, the community was in warring camps, neighbors squabbling with neighbors: the immigrants and their allies versus those who wanted them deported. Some like the members of St. Bridget’s, feed, clothe and shelter the stranger, the migrant, the fearful. Others set aside the demands of Matthew 25 on behalf of their own fears and prejudices. To this day I wrestle with questions about how the Christian community can be so polarized. What I don’t question, though, is that the Catholic Church was firmly in the right place: standing in defense of the dignity of every vulnerable immigrant. Because they could only commandeer the Cattle Congress for a limited time, the prosecution had 72 hours to bring charges on most of the detainees. Typically these would be immigration charges, but in this case, criminal charges were made. The workers were charged with falsifying documents, even though many of them knew little about government documents. Prosecutors talked the detainees into pleading guilty, sacrificing an opportunity to claim justice. After serving five-month sentences, most of the detainees were deported to Guatemala or Mexico. Prosecutors talked the detainees into pleading guilty, sacrificing an opportunity to claim justice. Many women sacrificed their children, too: some mothers denied that they had children, out of fear of what might happen to their sons and daughters. In a cruel irony, these women were deported, while their kids had to stay behind in Postville. The mothers who admitted to having children were allowed to return to Postville after their arraignment to care for them. They were unable to work and had to wear ankle bracelets that required them to be plugged into a wall for at least two hours each day. The ripples of the immigration action went far afield. The economy of Postville and the surrounding area crashed after the raid. It was not just the deported immigrants and their families that suffered in the wake of the round-up but an entire community. I returned to Postville ten years later, on Friday, May 11, to attend “The Summons.” The event was an interfaith gathering at St. Bridget’s marking the 10th anniversary of the immigration raid. The church was packed with nearly 1,000 people, the crowd overflowing and standing room only. The gathering marking the 10th anniversary of the immigration raid was packed with nearly 1,000 people. Activists at "The Summons," the interfaith gathering commemorating the Postville immigration raid. Standing among the crowd, I felt grief. I ached with disappointment that we still have not established compassionate immigration reform. I felt sorrow and disappointment with humanity for not getting our act together and building up more just systems. As one of the speakers, the Rev. Paul Ouderkirk, proclaimed, no one would drive a 40-year-old car without overhauling many of its systems. So why do we keep driving under the current immigration laws? The stories in Postville are just a fraction of the many human rights violations and injustices that are happening against poor immigrants all over the United States. During the prayer service, I also wondered about the state of the 32 people who, just two days earlier, had been arrested during a raid at a concrete plant in Mount Pleasant, Iowa. I felt my body tighten as I sang and prayed with the crowd, and I tried to offer my broken heart to God. Today, Somalian refugees have taken on the work left by the deported Latino workers at Agriprocessors—now renamed Agristar. Many storefronts have become empty shells, property values have dropped, many people have moved away. Maybe they moved because the place is no longer what they want it to be: a thriving agricultural town centered around descendants of German and Scandinavian immigrants. 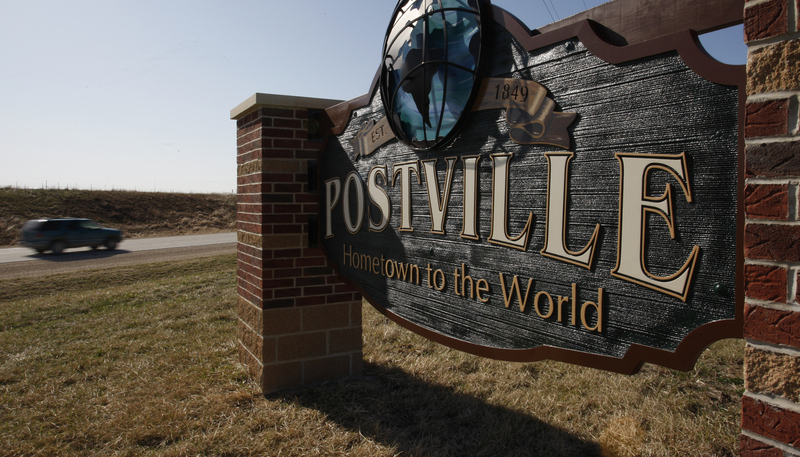 Some might say that while Postville is dying, the raid is not the cause of its current plight; the town struggles with the same decline as most of rural America in a post-industrial era. Others might argue that Postville continues to thrive; that the continued diversity, Muslims living side by side with Orthodox Jews, is its greatest richness. In the church, division will always be part of our story, our pain. As Catholics, we take a decisive stand on behalf of immigrants and other “undesirables.” This sometimes creates an inevitable rupture with others who see things differently. Yet we are all part of the same church, a community that must move toward unity while division and sorrow persist. We must listen to each other and connect under this cross. As took place at "The Summons," we must tell the truth and admit our pain. Only through sharing can we become more whole and experience true communion. Correction, July 2: This article originally misspelled the name of Archbishop Michael Jackels of Dubuque. The editors and authors of America would be taken more seriously if they had a recommended immigration policy. Otherwise we have to live with what we have and have it enforced in law. Stories like this are emotional and tug at your heart but why did it have to happen? Why were there so many people in Pottsville that were not legal immigrants? Each year about a million enter the country legally while millions more wait patiently for their opportunity. Why weren't the people of Pottsville taken from these legal immigrants? There are no easy answers to this but a legal system must be the answer. This article also appeared in print, under the headline "Standing in the divide: The Postville immigration raid, 10 years later," in the July 23, 2018 issue. Julia Walsh, a member of the Franciscan Sisters of Perpetual Adoration, is on staff at Marywood Franciscan Spirituality Center in Northern Wisconsin.